Take a guided nature walk through the grounds of Graeme Park and learn about how our colonial forefathers would have used the land and the resources found here. Leashed dogs welcome. Graeme Park (pronounced GRAM) is a 42-acre historic park, featuring the Keith House, the only surviving residence of a Colonial Pennsylvania Governor. The mansion has remained virtually intact since the late 18th century. 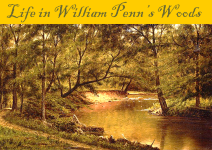 A visit to Graeme Park is nature trails, a picnic lunch, and a visit with the politicians, physicians, patriots, loyalists, poets, and writers who frequented the Keith House. ©2016 Friends of Graeme Park. All rights reserved.